Once you arrive in Mammoth, you won't really have much need for your car as the town transportation system is fantastic. We have a "feet first" policy in Mammoth which was established to get you to walk more and take public transportation so we can keep our town pollution free. 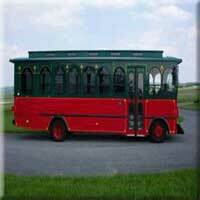 Try one of the many free trolley's and shuttles, or for custom trips, try the Mammoth Limos or Taxis. Groups come to Mammoth via bus. There is no better way than having the fun party on the bus. Buses can range in size from 33 - 60 people and to be the most economical it pays to have at least 45 people. City Concierge arranges charters for corporate groups and organizations and we make it very easy for you. We have supplied buses for groups up to 350 and they had a lot of fun traveling. Call us to get a quote 866-864-6444. Note: There is NO bus service from any company available for single riders. City Concierge can help you set up private or semi-private sightseeing tours of Mammoth Lakes and the surrounding area. These are not canned "map of the star homes" tours, but geared especially to your interests. These custom guided tours go to the more popular sites and are one of the best ways to pack the most amount of sites into your vacation. You'll get good information that will make the vacation much more rewarding. Tours might consist of seeing Yosemite, Mono Lake, Reds Meadow, Devils Postpile and Bodie Ghost Town. There are minimum /maximum people required for a tour to operate but not everyone on the bus needs to be from the same group, you can share! The Mammoth Trolley runs all summer long and is FREE! Hop out of the taxi and into one our our Mountain Limousines. Custom pick up and delivery for those with discriminating taste. These are large "mountain limos" usually a custom Denali or Yukon limo designed for comfort and for the heavy snow. They are also available for weddings, group events and private tours. Call us for a reservation. Mammoth Taxi runs shuttle service from Mammoth Airport for all flights arriving and departing on Horizon airlines. They are waiting for you when you arrive. If you have booked your lodging reservations through us, we offer door to door taxi service cutting down on the time spent waiting at the airport and checking in. The drivers will have your room keys for you. Call us with your flight information and reservation number and we will set it up for you. The Mammoth Ski Area in cooperation with the Town of Mammoth run shuttle buses. Mammoth has several bus lines, including the Red Line, Blue Line, Yellow Lines that operate throughout the year with extra service in winter to service the ski area. In winter they run as often as every 15 minutes, and then slow down as it goes into the evening. The run until the restaurants and bars close. In summer there is the trolley which runs from the Village, past the hotels and down the shopping areas of Main Street and then on to Old Mammoth Road. It makes a complete loop every 30 minutes. You catch it at any sign post that has the trolley sign on it from 9:00 AM -9:00 PM daily.